We both woke at 5.30am and because it’s Jan’s birthday she rose first to make me a cup of tea. After waiting 15 minutes it dawned on me she was taking advantage of the big day and I’d be going thirsty! There was a quite a northerly wind blowing across the canal on our mooring at Fox’s Gate so Paul (nb Piston Broke) came out to say goodbye and ensure we got off the armco sheet piling safely. I suspect it was more a case of wanting to ensure the novices on Waiouru didn’t scrap down the newly painted side of Piston Broke! The curtains were still drawn on nb Serena as we crawled past on tick-over. But then Judith and John had mentioned they weren’t early risers. nb Yarwood had already gone so they must have heard we were in the neighbourhood lowering the general tone. Waiouru ‘crabbed’ down towards Braunston for the first half mile being buffeted by the wind. Then we entered a cutting and things became much calmer. At the far end of the cutting we came upon this pair of old boats. Slightly further towards Braunston we passed a second pair. 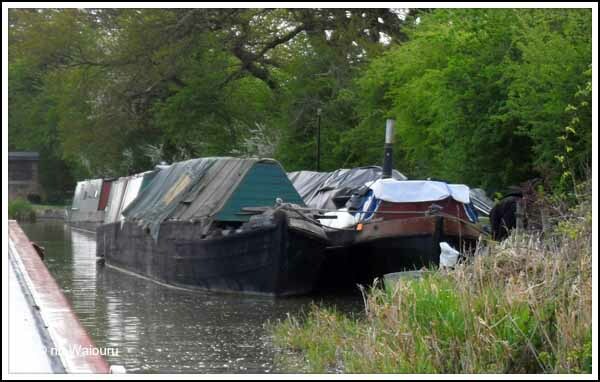 Both of us are reasonably confident we saw these two boats in the same location back in 2005 when we came to the UK and completed the Warwickshire Ring. I remember thinking to myself “The ‘ar$e’ is falling off that boat!” We couldn’t believe people were actually living on them. Although it looks like some of the water in them must have leaked out the bottom because they now look higher in the water. The plan was to fill the water tank at Braunston but there were two boats already on the facilities moorings so we pressed on towards Rugby. There are no photos of Braunston as we intend going back that way later this month. About a kilometre out of Braunston there was a “clunk” sound from under Waiouru as we passed through a bridge hole. The ‘feel’ of the tiller then felt rather strange so we stopped and moored (with considerable difficulty). After turning off the engine (safety first) I rolled up my sleeves and practiced my braille on the shaft and prop. The unwelcome guest must have already realised eviction was on the cards because the area was free of obstructions. My assumption is all the “too’ing and fro’ing” getting Waiouru moored had dislodged the freeloader! We were now the tail end of a convoy of four narrowboats slowly crabbing along in the wind. Eventually an ABC hire boat caught up with us followed by another private boat. The six boats continued to slowly make their way north before the boat in front of us reversed direction at the winding hole. 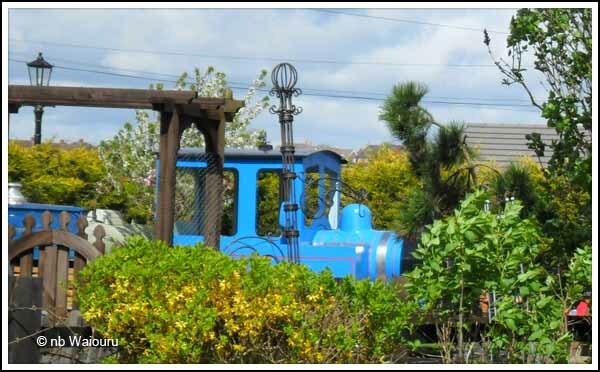 It was about then Jan realised the railway paralleled the canal as she could see a blue locomotive waiting to depart. A number of boats passed us going in the opposite direction and; as you would expect with our luck; we met one in a bridge hole on a blind corner. No collision but we can report the Axiom prop seems able to stop Waiouru reasonably quickly! When one of the boats passed the lady aboard became very animated and called out “I’m Lisa, and I read your blog!” I continue to be surprised people would waste their valuable time reading these boring rambling with poor grammar, spelling and punctuation! Anyway, “Hi Lisa on nb What a Lark. We recall your comment left on a post back in October 2012 and suspect it was about the same time as What a Lark was launched? Happy cruising! 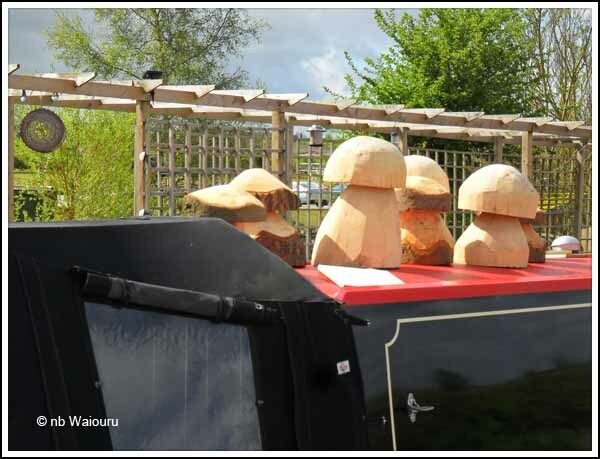 Along the way we passed a boat that had wooden mushrooms phallic symbols stools for people with hemroids replica statues from Easter Island (?) at £25 each. After reading so much about Barby Moorings whilst on the other side of the world it was interesting to go past and get a first hand look. All I can say is it looks exactly as described…….. A project with a cash flow problem? The sun came out during our transit down the three locks at Hillmorton; although the wind didn’t let up! 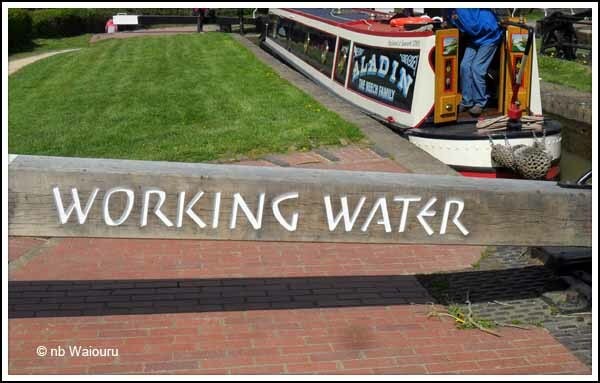 Jan was assisted by the voluntary lock keeper who mentioned it had suddenly become very busy. 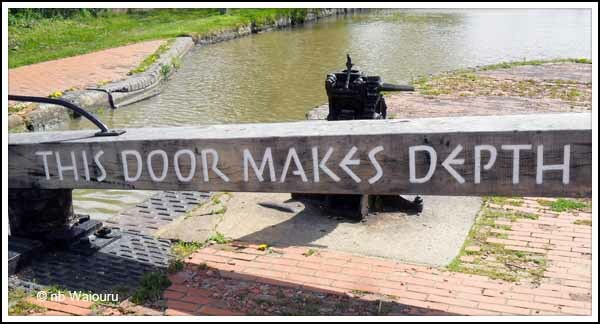 Jan managed to take a couple of photos of writing on the new lock gates. Both of us hope they didn’t cost any more than a normal gate. I suppose they are a source of interest to some people. We’re not in that category! There was a water point below the bottom lock and we used the opportunity to top up the tank. Not much pressure but we weren’t in a hurry! The moorings before Tesco were all full. That wasn’t much of a problem as I think they might only be 24hr. We passed the water point near Tesco and then moored on the 14 day moorings. There are mooring rings but we can’t get against the bank. The first task after mooring was to extricate Jan’s shopping trolley with the ‘wonky wheels’ and head off to Tesco for victualing. Jan had already received a promotional email from Tesco advising if she spent £60 she would receive a voucher for 10p discount per litre on petrol. As we’re hiring a car stocking up the pantry seemed a good idea. 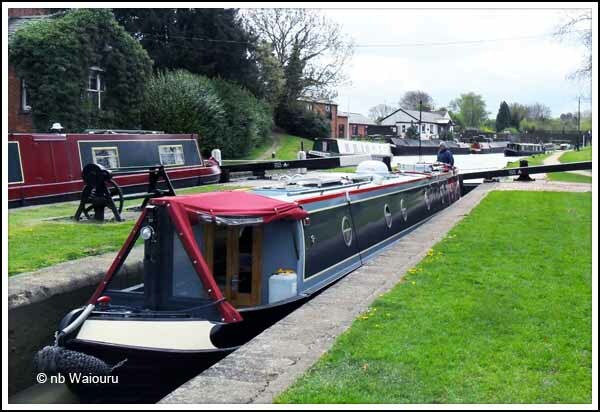 Another thing we’ve realised we must do is mark good mooring locations on our laminated Pearsons Canal Guidebooks. So a permanent marker pen was another purchase at Tesco. Because it Jan’s birthday I’m treating her to a cooked meal. I haven’t decided whether it will be the “golden arches” or the “deep fried rat in 11 secret herbs and spices”. I know she will be so grateful that she doesn’t have to cook tonight! I don’t know why my FMIL (favourite mother-in-law) thinks I don’t have a romantic bone in my body! Yes I was animated!! 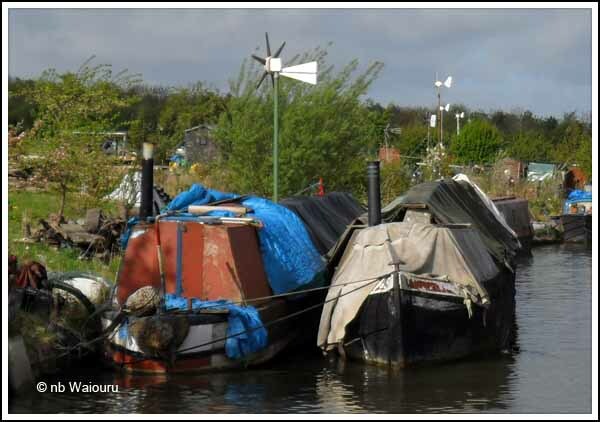 I was so hoping to have bumped into you later this week as we were making our way back to base after being on The Ashby Canal last week. I am sure you agree but it really is fabulous seeing you both enjoying the canals after your dreadful start. We are off home to check up on our mothers and for David to play golf matches (That part is a rubbish reason to go home). Oh my word did we have a fight on with the boat with the meandering canal after you whizzed by, moored boats on corners and a small gale headwind. Happy Birthday Jan hope the celebratory meal was good. Well that birthday meal better had been good Tom! Jan enjoyed the Scottish food which was (fortunately) still hot (actually warmish)by the time I returned with it to Waiouru. Jan was most appreciative that I was prepared to walk the mile in the cold and rain to buy her MacDonalds for her birthday treat. I always find it quite daunting navigating in the wind, last week we attempted reversing out of the arm we are moored in and it was tricky to say the least. Also something I find even more daunting is opening the weed hatch! You never know what you're going to find! belated best wishes. I'm not sure whether to suggest that a quick romance re-training package is in order for him. I would risk catching myself in the mirror were I to do so.